These kababs will definitely become the new favorite appetizer in your family. A crowd pleaser for sure. Leave your guests guessing the main ingredient of these kababs. I will not write any more praises about these kababs and will let you make them and believe for yourself. There are several recipes for dahi kabab and here is my recipe which I originally learnt from NDTV Cooks but with my own changes. 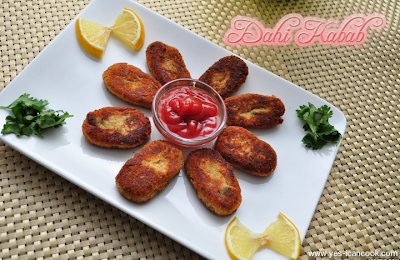 Dahi Kababs are made using hung curd. Hung curd is strained yogurt. Hung curd can be very easily prepared by passing regular yogurt through a muslin cloth, tightly tying it up and hanging it over a sink or bowl and letting it slowly drain all the liquid for several hours (minimum 4-5). The thick curd which remains in the muslin cloth is the hung curd. I used Labneh to prepare dahi kabab which is easily available all over middle east in super markets. You can even substitute with greek yogurt. Before I post the recipe I would just once like to say we love these kababs. They tasted even better the next day when I warmed them up in the microwave for just 30 seconds. 1. In a small pan dry roast the gram flour over low flame for a minute till it gets slightly roasted. Do not let it turn brown or burn it. Keep stirring with a spoon. Keep it aside to cool down. 2. In a mixing bowl add labneh, roasted and cooled gram flour, green chilli, coriander leaves, salt, cumin powder and mix well to combine. 3. Place this in the refrigerator to chill for an hour. 4. Wet your hands slightly or oil them lightly. 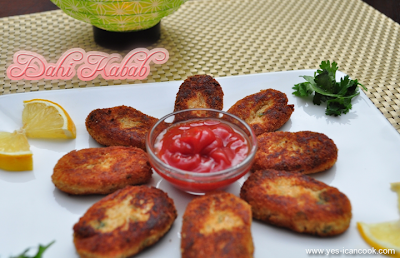 Take some of the chilled mixture and form a kabab of desired shape. A disc or a bar. 5. Roll it in bread crumbs and place it on a plate. 6. Make kababs with the entire mixture. The mixture is a little tricky to handle and form into a shape but it is not difficult and is doable. 7. Heat oil in an open wide pan. 8. 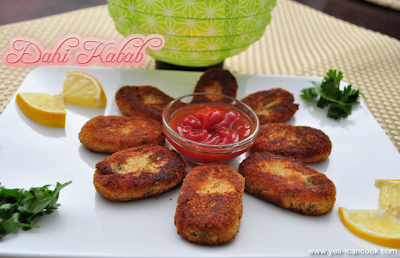 Place the prepared kababs on the pan and shallow fry on low flame on both sides till they turn golden. 9. Remove onto absorbent paper and serve warm. 1. 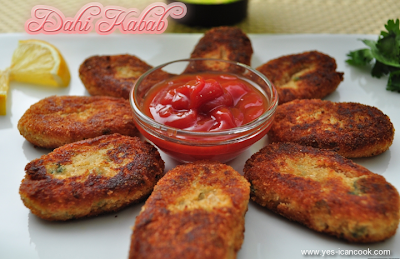 You can prepare the kababs and place them in the fridge to fry when needed. 2. You can even fry them and wrap them in aluminium foil to warm up later and they taste good. 3. I have not frozen them so I will not be able to write about it. They are not very crunchy. They are quite soft. Its lovely, the crispy coating and when dip into the sauce, ahh! another extra flavor over the kababs. Not sure if I can find hung curd over, so I may have to use other types. We simply love such a dish and keeping it aside to be tried for the weekend. Wow Navaneetham. Thanks for those lovely words. You can make hung curd easily using regular yogurt. You will also find any form of substitute. Visit a major supermarket with good dairy collection and ask for greek yogurt or strained yogurt. Mind if i ask where do you live? I am happy to hear again from you. wow.....fantastic....super delicious...this is a must try to do in list....here is rainy...perfect for the afternoon snack!!!! You will love them Pooja. Let me know how you like them if and when you try them. ahh lovely kababs.. Thanks for sharing.. just loveeeeellllyyyyyy!